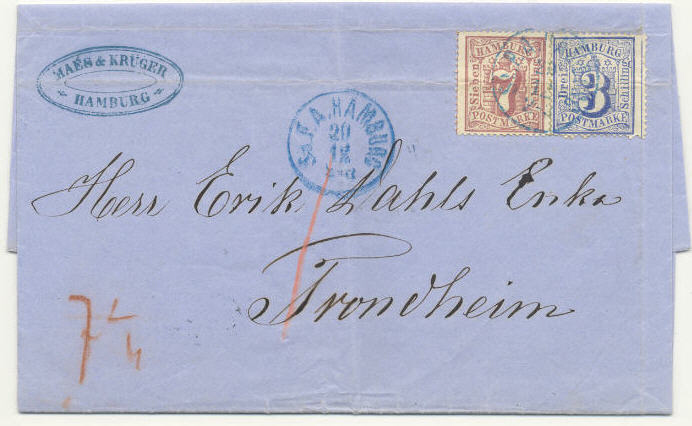 * HAMBURG - Michel 15 and 19 - Coat of Arms - single copies of 3 S and 7 S = 10 Schilling cancelled "St.P.A.Hamburg 20.12.1866" in blue on a beautiful single weight cover sent via Christiania to Trondheim. In spite of a light filing crease through the stamps, this is a very unusual piece. 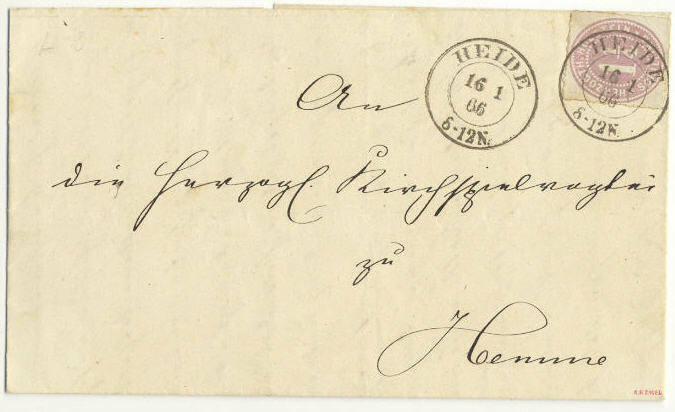 * BAYERN - Michel 5 - single copy of 9 Kreuzer with numeral cancellation "220" on a single weight cover cancelled "Ichenhausen 17.3" (1857) sent to Friedrichshalle. 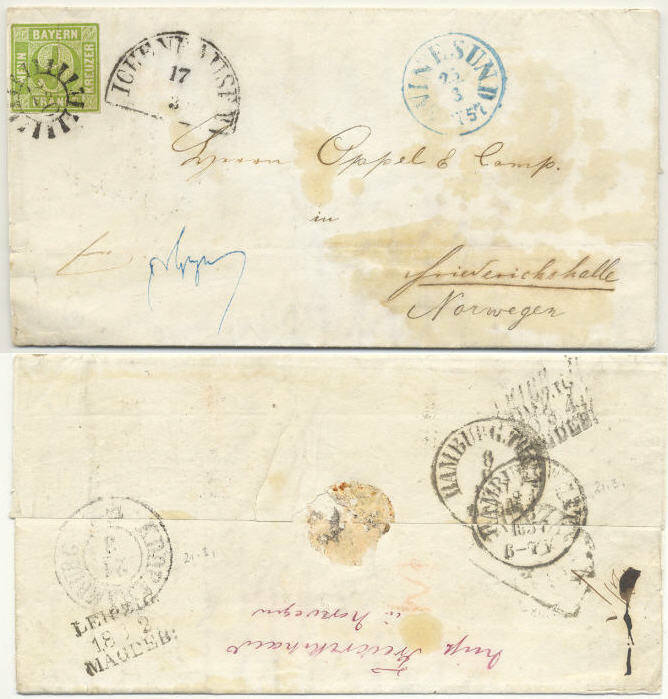 Because of the misspelling of the address the cover has first wrongly been sent to eastern Germany. 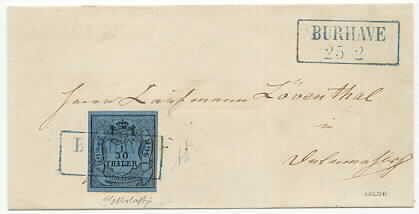 Arrival mark "Svinesund 25.3.1857" on front. * BRAUNSCHWEIG - 7a. 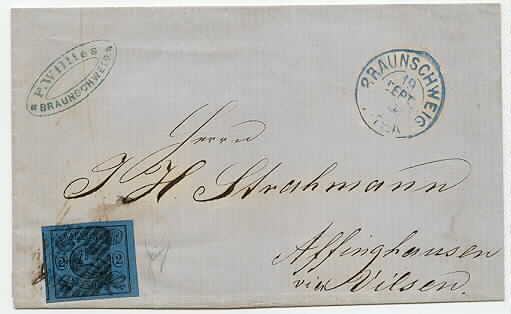 2 Sgr black on blue with numeral cancellation "8" con cover cancelled "Braunschweig 19 SEPT 1862" sent to Affinghausen bei Vilsen. Cert : Gertrud Lange BPP. * HANNOVER - 15. 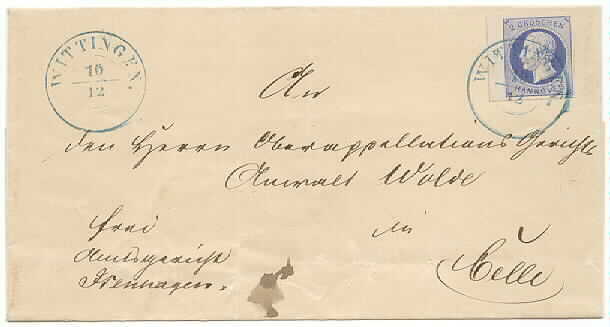 2 gr King George V - copy with large left margin - cancelled "Wittingen 10.12" on cover sent to Celle. Ex. John R. Boker jr.
* HELIGOLAND - 13 a and 14 d. two pcs. 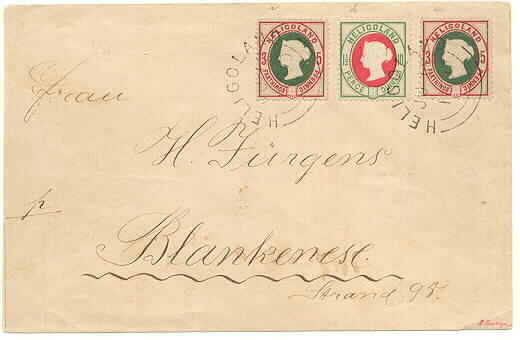 3 farthing = 5 pf and slngle 1 1/2 p = 10 pf - cancelled "Heligoland JU 18 1890" on cover sent to Blankenese. * OLDENBURG - 2 III. 1/30 thaler Coat of Arms 1852 - cancelled "Burhave 25 2". Signed Bolaffi and Bretti (BPP). Superb quality. 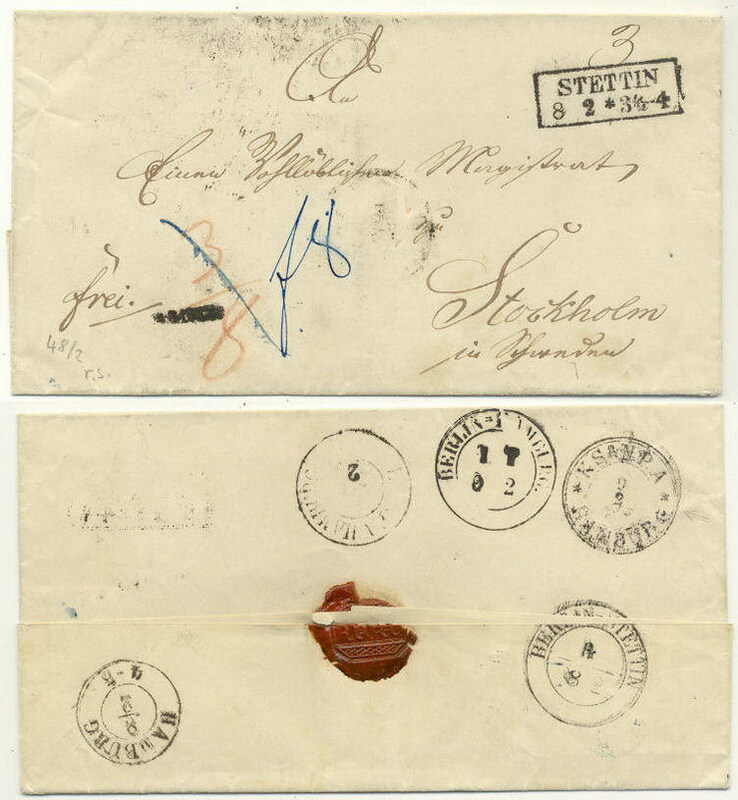 * PREUSSEN - cover cancelled "Stettin 8 2 * 3 1/2-4" sent via Berlin-Stettin and Berlin-Hamburg to Stockholm around 1855. * SCHLESWIG-HOLSTEIN - 20. 1 1/4 scilling brownish purple - cancelled "Heide 16.1.66" sendt tol Hemme. Ex Jacob Engel.